Dance is a form of expressing our moods & attitude. Listening to our favorite music we all murmur & shake our body whether we are in a group or taking shower. 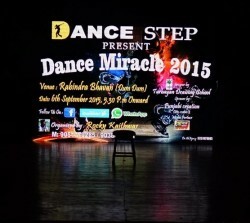 Dance Miracle 2015, an awesome dance event organized by Rocky Kaithwas & his team took place at Dumdum Rabindra Bhaban on 6th Sept, 2015. Performances by kids took this event to a new level. More over The Zumba performance performed by special guests & Rocky was outstanding. Rocky runs a Dance Institute named Dance Step. He has been organizing Dance Miracle for last 3 years. This event was different from other events because he mixed up innocence with excellence perfectly. ~ Stay connected with us for more updates and information about Rocky and his “Dance Step”.